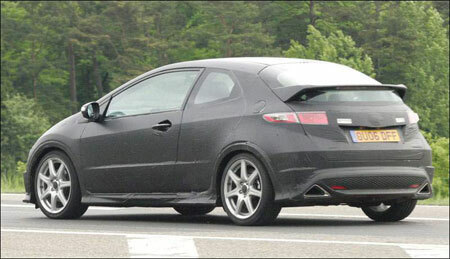 Honda has been seen testing it’s 2007 Honda Civic Type R on German grounds. The 2007 Honda Civic Type R will be based on the three-door version of the Honda Civic Euro. Previously, Honda showcased a 2007 Honda Civic Type R Concept at the Geneva Motor Show, a stunning kitted out yellow speed demon. 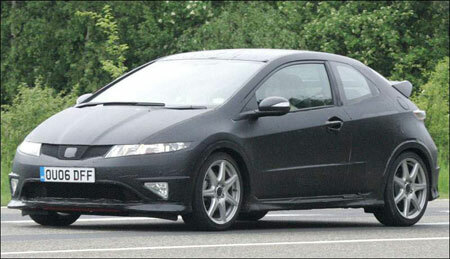 The 2007 Honda Civic Type R will likely feature a 220hp i-VTEC engine similiar to the one found in the Acura RSX. The car will be front-wheel drive, no SH-AWD (Superior Handling All Wheel Drive) for this little speed demon. Two more photos after the jump.